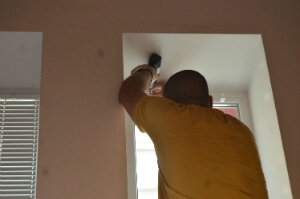 Handyman Decorating & Painting Thamesfield SW18 | Quality Property Care Ltd. Enjoy the expert house improvement and repair services in Thamesfield SW18, call 020 3746 4287 and ask for our professional handyman services in Thamesfield SW18. Define your needs and we will send a tradesman to aid you however he can. Odd jobs - simple tasks that anyone can do but doesn't have the time or has other limitations. Decorating And Painting - including tiling, skimming and plastering, sealing/ grouting, wallboarding, etc. Interior and exterior painting. The property maintenance company Quality Property Care Ltd. in Thamesfield SW18 is fully on your services. We can offer you furniture assembly, flat pack, painting and decorating, all types of odd jobs, indoor and outdoor fix-up tasks, hanging and wall installation: all at budget-friendly prices! Standard repair work has been never that simple and fast to be accomplished! Please, note that all of our handymen are fully insured and vetted. Your house and your personal belongings are at safe hands. We also take care of damages in case of omission! Quality Property Care Ltd. technicians do house plumbing including fixing leaking taps and pipes, repairing toilet flush and cisterns, unblocking pipes, unblocking toilets, simple plumbing in bathrooms and kitchens, installing washing machines, replacing taps and washers, dealing with bleeding radiators. For your business we can fix leaks and water damage, unclog urinals and pipes, deal with toilet installation along with a special maintenance account tailored for your needs. For rented properties we can replace sinks and basins, replace waste disposal units, re-seal baths and shower trays all of this with a secured satisfaction and full insurance coverage. To book the requested handyman service, call 020 3746 4287 or fill out the online booking form right away, and you will receive written confirmation with the time and date of your booking slot. If you have an emergency, there is a probability of same day booking as well. The booking is hourly based, but for more complicated tasks, or for a number of handyman tasks, you can book a half or full day package of handyman services. Go ahead, call now and get all those small problems in your home or office interior and exterior resolved!